The Open Source Application Development Agreement is used for general software development projects that are based on using Open Source components. 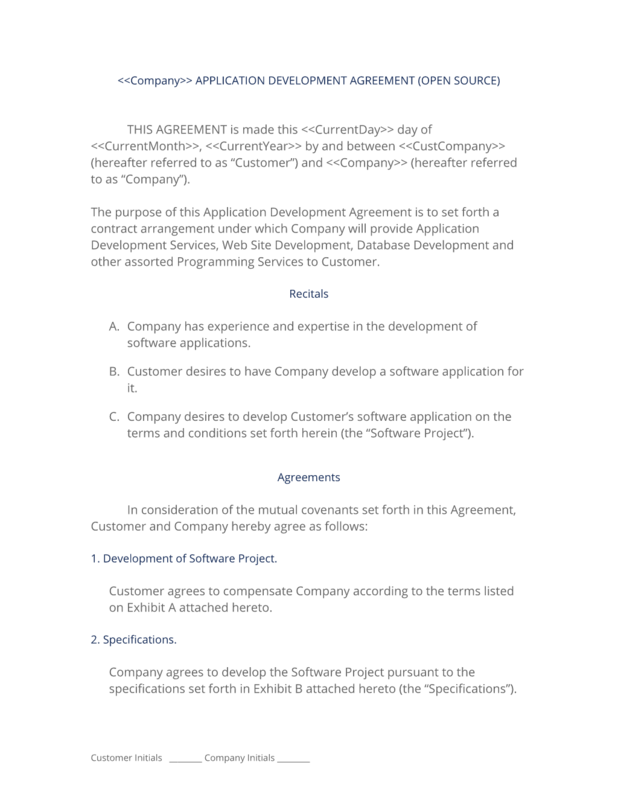 This Agreement is used as the starting point for any type of software project. This software development contract includes clauses specific to the use of third party open source products. has been invaluable to me. I can quickly put Company Logos on the documents and revise as needed without having to reinvent the wheel. I am glad a lot of the work has already been done and it looks great and professional as well as being easy to use. Great product, I highly recommend it." This Open Source Application Development Agreement is included in editable Word format that can be customized in Word or by using the included Wizard software. How do you write a Open Source Application Development Agreement document? THIS AGREEMENT is made this Current Day day of Current Month, Current Year by and between Company Name (hereafter referred to as "Customer") and Company Name (hereafter referred to as "Company"). The purpose of this Application Development Agreement is to set forth a contract arrangement under which Company will provide Application Development Services, Web Site Development, Database Development and other assorted Programming Services to Customer. Company has experience and expertise in the development of software applications. Customer desires to have Company develop a software application for it. Company desires to develop Customer's software application on the terms and conditions set forth herein (the "Software Project"). Company will use reasonable diligence in the development of the Software Project and endeavor to deliver to Customer operational Software Project files as soon as possible. Customer acknowledges, however, that this delivery deadline, and the other payment milestones listed in Exhibit A, are estimates, and are not required delivery dates. Company will make every effort to advise Customer of any delays in advance and seek Customer feedback in regard to the proposed timeline as the Development process progresses. Customer shall hold all rights, title, and interest in the Software Project and the Software Project design and content as a whole, excepting all pre-existing works rightfully owned by Company or third party copyright holders. Customer shall hold all rights, title, and interest to all text, graphics, animation, audio components, and digital components of the Software Project. Company shall hold all rights, title, and interest in all pre-existing works, interfaces, navigational devices, menus, menu structures or arrangements, icons, help and other operational instructions, and all other components of any source or object computer code that comprises the Software Project, all pre-existing literal and non-literal expressions of ideas ("Company's Style") that operate, cause, create, direct, manipulate, access, or otherwise affect the Software Project, and all other pre-existing or proprietary copyrights, patents, trade secrets, and other intellectual or industrial property rights in the Software Project or any component or characteristic thereof. Customer shall not do anything that may infringe upon or in any way undermine Company's rights, title, and interest in the Software Project, as described in this paragraph 4. Notwithstanding the above, Customer shall retain all of its intellectual property rights in any text, images, or other components it owns and delivers to Company for use in the Software Project in addition to the physical presence of the site itself. Customer shall be provided with a copy of all source code, source files, and graphic files as a part of this Agreement and there shall not be any additional royalty, license, or other payment required of Customer to Company for the intended use of the Software Project. Company may, at its discretion, host portions of the Software Project at its own cost to facilitate development and testing of the Software Project. Company will provide development services according to the Specifications attached as Exhibit B. Proprietary information exchanged hereunder shall be treated as such by both Company and Customer. This information shall include, but not be limited to, the provisions of this agreement, and both parties' product(s), services, information, and pricing. Customer further agrees to not decompose, disassemble, decode, or reverse engineer any Company-owned program, code, or technology delivered to Customer, or any portion thereof. Company will exercise no control whatsoever over the content of the information passing through any part of the Software Project. Warranty That Software Project Shall Work According to the Specifications. Company warrants that the Software Project will conform to the Specifications and upon written notification of a defect or other non-conformation to the specification, Company will work to bring the Software Project into conformance with the specification at its own cost and in as timely a manner as possible. Company is not responsible for defects caused by changes or issues resulting from third party tools or applications it does not have direct control over, including, but not limited to: web browsers, operating systems (OS), plug-ins, extensions, software programs, applets, newly discovered vulnerabilities, scripts, or other items. Company makes no warranties or representations of any kind, whether expressed or implied for the suitability of any of the Open Source applications, solutions, components, source code (whether in part or in whole) installed or otherwise utilized in the delivery of the Software Project. Company is not responsible for the maintenance or use of such now or in the future, including all upgrades, patches, and incompatibilities with software and third party applications or any other problem or disruption arising out of the use of Open Source. Customer warrants that it has the right to use any applicable trademarks or copyrighted material used in connection with this service. Company warrants that it has the right to use any applicable trademarks, service marks, or other copyrighted material(s) used by Company in the development and implementation of the Software Project, which have not been provided by Company. Customer acknowledges that the solutions being provided by Company are "Open Source" and Customer is being granted a Worldwide, non-exclusive license, under the General Public License (GPL) to deploy, modify, or otherwise use the Open Source Code in their business or enterprise. In the event that Customer or Company contemplates whole or partial sale of its business, ownership change, or change in jurisdiction during the course of this Agreement, parties shall notify one another by mail, facsimile, or email no less than 30 days prior to the effective date of the event. Customer may terminate this Agreement at its sole discretion, upon one or more of the following events: 1) failure on the part of Company to comply with any provisions of the Agreement upon receipt of written notice from Customer of said failure, 2) appointment of Receiver or upon the filing of any application by Company seeking relief from creditors, or 3) upon mutual agreement in writing of Customer and Company. Customer shall indemnify and hold Company harmless from and against any and all claims, judgments, awards, costs, expenses, damages, and liabilities (including reasonable attorney fees) of whatsoever kind and nature that may be asserted, granted, or imposed against Company directly or indirectly arising from or in connection with Customer's marketing or support services of the product or services or the unauthorized representation of the product and services or any breach of this agreement by Customer. Customer warrants that everything it gives Company to incorporate into the Software Project is legally owned or licensed to Customer. Customer agrees to indemnify and hold Company harmless from any and all claims brought by any third party relating to any aspect of the Software Project, including, but without limitation, any and all demands, liabilities, losses, costs, and claims, including attorney's fees, arising out of injury caused by Customer's products/services, material supplied by Customer, copyright infringement, and defective products sold via the Software Project. Customer grants Company the right to reference the Software Project for promotional purposes and/or to cross-link to it with other marketing efforts developed by Company. Company may not, at any time, disclose or grant access to Customer's Software Project private information, resources, or any other non-public asset used for the purposes of promotion or marketing. Company has no responsibility for any third party taking, stealing, "hacking," altering, or otherwise modifying all or any part of the Software Project, Source Code, Object Code, Graphics, Text, data, or any other materials related to the Software Project. Company has exclusive rights in making any derivative works of pre-existing or open source code or related graphics and animations. Customer acknowledges that similarities may exist between other Software Projects developed by Company for Customer and any such similarities, both past and future, constitute Company's artistic style and proprietary information. Customer agrees that Company's links will be placed on the bottom of the front page and on internal pages of the Software Project in a mutually agreeable small type font. Customer also agrees to put Company's copyright notices in any source code where pre-existing or proprietary information is present. Source code copyrights shall not be public unless a user views the source code directly. Customer agrees to display all legally required copyright notices as prescribed by applicable law. Company will not be responsible for fulfilling its obligations under this Agreement if such failure is caused by circumstances beyond the reasonable control of Company or its suppliers or contractors (including but not limited to acts of God, disasters, acts of terrorism, unavailability of materials, equipment failures, strikes, riots, wars, or other labor disturbances). The complete Open Source Application Development Agreement - with the actual formatting and layout - is available in this Contract Pack.